UK voters are still deeply divided over the Brexit referendum and its aftermath; as are the US electorate with respect to the 2016 Presidential race and Trump’s presidency. In both countries, millions of people have felt frustrated and disillusioned with the usual workings of democratic politics. The outcomes of these two votes have led many to question whether ‘the people’ can be trusted with such important decisions. In a recent survey, only 25% of Brits and Americans who were born in the 1980s agreed that it is ‘essential’ to live in a democracy! Weariness with democracy is nothing new but I agree with Edith Hall’s recent post on the importance of resisting it. It is very worrying that political historians and theorists are starting to talk as if democracy’s stealthy demise is inevitable. We should perhaps remember Winston Churchill’s (borrowed) observation that ‘democracy is the worst form of Government except for all those other forms that have been tried from time to time’. Oligarchies, dictatorships and ‘managed’ forms of so-called democracy destroy the rule of law, freedom of expression and the dignity of their people. By definition, they deny their citizens a proper say in how they are governed. We ought, then, to ask how we can make democracy work better for people, rather than flirting with the possibility of non-democratic systems or pseudo-democracies captured by ‘elites’ or ‘strong men’. Many voters in 2016 complained that politicians and successive governments had been ignoring them for years. People felt powerless, and were understandably receptive to the idea that they had been ‘left behind’ by an ‘elite’. But what might a time-travelling classical Athenian say? Probably that these disaffected voters really are powerless. Unlike our system today, Athenian democracy actually was a government by the people (dēmos). They did not rely, as we do, on an elite group of politicians and officials to do the work of governing on their behalf. The 500-strong Athenian Council (Boulē) was a key element in this more empowered and participatory system. It met almost daily and was responsible for the ordinary running of the city’s affairs. But it was also divided up into ten groups of 50 Councillors. We shall return to the question of how these representatives were chosen below. What is important to note here is that each of these smaller groups took turns to maintain a twenty-four hour presence at the heart of the city. As such, they were ready to take immediate decisions in the event of emergencies or on the arrival of important news. The Council also prepared the agenda of business for Athens’ very large people’s assembly (the Ecclēsia), where Councillors presided over the conduct of debates and voting. Whatever the Ecclēsia decided by a majority vote became the sovereign will of the people. That decision was then passed back to the Council for implementation. A surviving assembly decree of 325/4 BC reveals that this aspect of the Councillors’ job was both complex and crucial. The decree authorises the creation of a new Athenian naval station overseas. And it calls on the Council to coordinate with twelve different officers and committees to make this happen. Councillors had final responsibility for ensuring that the ships, equipment and men needed were delivered and dispatched in a timely and efficient manner. 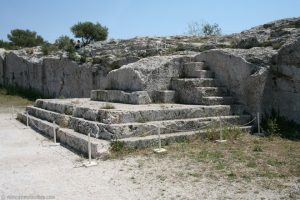 The Pnyx was where the Athenian assembly met. This picture details archaeological remains of the speaker’s plaftorm (Bema) of Pnyx III (a rebuild around 345-335 BC). The Bema was carved right out of the bedrock. View from the northwest. This may sound like the sort of work which could only be done by career politicians or professional administrators. And Athenian Councillors were indeed paid for their trouble; they could also be officially honoured by the Ecclēsia for doing good work. But, remarkably, a new Boulē was appointed every year via the random selection of male citizens over the age of thirty. Most of these citizens would have been ordinary farmers, craftsmen or businessmen. And they could only serve on the Council for a maximum of two years in their entire lives. This means that, in any given year, thousands of older citizens were able to draw on their previous valuable experience of governing on the Council when considering proposals put to the big sovereign assembly. What if an adult citizen never got to sit on the Council or was not yet old enough to do so? Well, he could still attend the Ecclēsia – the big sovereign assembly mentioned above. At least 6000 citizens had to turn up for this assembly to go ahead, and, in the fourth century, it met 40 times a year. Of course, wealthy ‘elite’ politicians such as Pericles and Demosthenes influenced such meetings with their proposals and speeches. But less articulate and powerful Athenians were still crucial actors in the process because of their vote and the noise they could make throughout the debates. An Athenian who attended only a few of these meetings each year was still likely to be feeling a lot more included and ‘empowered’ than most UK or US citizens do. Modern democracies have much greater populations of eligible voters than classical Athens did: tens of millions rather than tens of thousands. Despite this, some political thinkers have recently proposed that we can and should replace our elected parliaments with paid legislative bodies which would be appointed through randomised selection of ordinary citizens – either on a voluntary basis, by compulsory service, or a mixture of the two. Others argue that it just would not be practical for us to copy the highly intensive and inclusive Athenian system of participation. Alongside the problem of getting so many people involved, modern law-making and government seem too complex and time-consuming given the competing demands of work and family life in the 21st century. Perhaps we really do need professional politicians, administrators and experts to do it all for us. On the other hand, several recent and encouraging experiments suggest that we could mix some Athenian-style democracy into our ‘representative’ systems. For example, ‘citizen juries’ have been promoted and run in both the USA and Germany, where a panel of local residents is randomly selected to hear evidence from experts and advocates about a particular issue (e.g. business proposals which might help the local economy and yet adversely affect the environment). These juries then deliberate and agree certain recommendations, which can either be implemented straight away or else used by elected politicians to guide their final decision-making. Citizen juries encourage well-informed deliberations and decisions. They can reflect the voice of a whole community rather than particular factions or interests. And they give some direct power, governmental experience and responsibility back to ordinary voters. This is all very much in line with classical Athenian principles. Another problem with our modern democratic culture is that everyone is in a bubble of sorts, or ‘homophily’ (i.e. ‘love of the same’) – as sociologists prefer to call it. People tend to seek similarities in their friends, marriages, workplaces and neighbourhoods. We may consequently live and work in an environment where we rarely discuss current affairs with people who either disagree with us, or whose lives, backgrounds and cultures are very different to our own. And so, we may not hear about certain views and experiences which could change or deepen our current view of a political question. We may also miss out on crucial knowledge and evidence which are not available within our bubble because of the way social media operates. Networks like Facebook and Twitter, for example, lock users into personalised loops, each with its own feed of news and political inclinations. Thus, algorithms filter sources of information and topics to reflect the clicks, ‘likes’ and shares of our friendship group. Unless our friends have very divergent views and life experiences, everyone starts to see the same material and to post similar reactions. This, in turn, creates an ‘echo chamber’ in which the information you already know and the opinions you already agree with get repeated and amplified. Alternative views and new information which might challenge your opinions disappear from view; echo chambers also make it more likely that ‘fake news’ will be believed and shared. The extent to which hostile actors have so far managed to subvert democracy by feeding these echo chambers with false and divisive information is hard to gauge, but there’s little doubt that they are trying. Bubbles and echo chambers are making our own democratic societies more divided than is healthy. The more that we only hear the side we agree with, the more convinced we become of our own rightness (and the other side’s wrongness). Compromise, consensus and mutual persuasion become impossible. From one perspective, classical Athenian democracy was itself an exclusive bubble. If you were a child, woman, slave or resident foreigner of non-Athenian parentage, then you could not participate in any of its decision-making bodies. Aristophanes’ comedy Lysistrata jokingly hints that the Athenians might make better decisions about the war with Sparta if only they listened to the perspective and advice of their mothers, wives and sisters. But the Athenian system was at least designed to prevent division and ‘echo chamber’ effects among the male citizens who were eligible to participate. For example, each of the ten groups of 50 which made up the Boulē represented a different Athenian tribe. And the membership of each tribe was deliberately designed to contain communities from the three different regions of Athens’ territory: inland, coast and city. So the Council forced citizens to meet, mingle and ‘do’ democracy with strangers who lived miles away from them. Even if you did know some men in your own group of 50, you were unlikely to know many of the other 450. Thus citizens of different ages, walks of life and regions were compelled to share diverse expertise and information and to work together to solve problems. The Boulē was the ultimate anti-bubble. But the larger Ecclēsia too was good for making sure that the dēmos got to hear opposing arguments and shared new information. Ordinary citizens had time to reflect on what they were hearing, to change their minds or suggest improvements. Inscriptions make clear that it was not just the well-off and well-known politicians who got up to move important amendments to key proposals. Indeed the system encouraged and allowed the mass of ordinary citizens to alter or reject what was put before them. Thucydides even records one occasion where the Ecclēsia voted to kill the entire male population of the rebellious city of Mytilene, but then had a second meeting at which it narrowly changed its mind the next day. As student councils or debating clubs can tell us, face-to-face discussion is often more reasonable and useful than what you can achieve online. Debating together in an officially recognised body also reminds us of our common goals, over and above what divides us. But we cannot stop the rise of all the news, political activity and opinion-forming which takes place online; in other words, we should embrace and learn to utilise online tools effectively to filter out the bubbles and encourage a meaningful dialogue between diverse groups. In the last interview of his Presidency, Barack Obama even expressed the hope that ‘we can create a virtual public square that feels better for people’. He argued that it is by public consensus, rather than deep division that democracies solve political problems. Maybe it is time for us all to create a massive online Ecclēsia. This is a very slightly adapted version of an article published in Issue 74 of Omnibus Magazine (September 2017). This magazine is published by the UK Classical Association and aimed at secondary schools. Thanks to the editor Kathryn Tempest for making me aware of ‘homophily’ as a sociological category. Sadly, though, far too few British children are educated about the ancient Greeks and Romans at secondary level. If you agree that more secondary school pupils should have the chance to learn about Greek and Roman culture and politics as a means of informing their future lives and responsibilities as democratic citizens, then please get involved in the new UK-wide ACE project (Advocating Classical Education). J. Ober (2008) Democracy and Knowledge. Innovation and Learning in Classical Athens (Princeton University Press). This entry was posted in General on 22 December, 2017 by Jon Hesk.